Organised by French fruit and vegetable research agency Aprifel, the three day event brought together multi-disciplinary knowledge and stakeholders to explore and develop concrete recommendations for policy and practice changes. As part of the conference N8 AgriFood hosted a food systems session focusing on the impact of modern food systems upon behaviour, diet and health. The session was chaired by N8 AgriFood’s Theme 3 Lead, Prof Jason Halford, pictured above left, and co-chaired by Dr Joao Breda from the World Health Organisation European Region. Dr Christian Reynolds, one of N8 AgriFood’s Knowledge Exchange Fellow based at the University of Sheffield, pictured above right, gave a presentation demonstrating the marked changes in our diet over time and how what, where and how we eat, also differs radically across generations. He talked about how the current agri-food system has provided us more than enough food but that has been at a cost to health. However he said not all change has been bad, and understanding modern healthy eating trends should enable us to amplify positive change, as long as options are available, affordable, acceptable and importantly convenient. As part of the session Dr Athena Linos, from Athens Medical School, spoke of the challenges schools have faced with the dual burden of hunger and obesity in children in the aftermath of the global economic crisis of 2008, austerity imposed on the Greek government, and failure of policy makers to face this pressing issue. 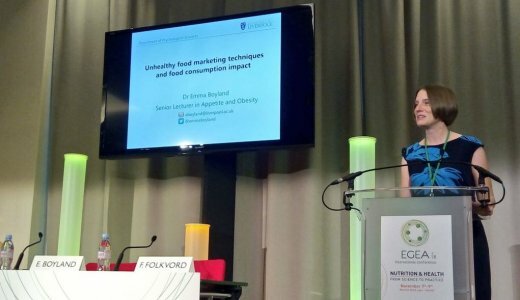 Also presenting was Dr Emma Boyland, from the University of Liverpool, pictured left, who revealed the extensive and pervasive influence of marketing unhealthy food on children. She talked about how brands use themes designed to appeal to children and exploit social norms, which are then reinforced by peer influence. Dr Boyland said social media enables marketers to target the child, and that children don’t discern this as commercial promotion, with its targeted nature making it difficult for parents or regulators to track. 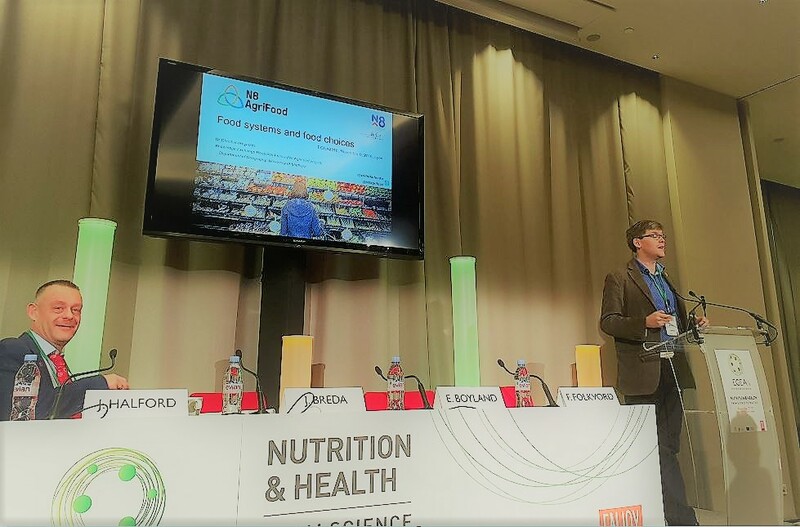 The N8 AgriFood session also featured a talk from Dr Frans Folkvord, of the Behavioural Science Institute at Radboud University, in The Netherlands. He considered how marketing techniques could be used to promote healthier choices in children, but said health preferences are often undermined by innate and learnt preferences in the presence of unhealthy options. Dr Folkvord said investment in healthy eating messages is dwarfed by commercial food promotion, but addressing this, along with changes in the physical food environment and shifting social norms, may increase the likelihood of success. The N8 AgriFood session highlighted the intractability issues such as inequalities and commercial exploitation, emphasising the need not only for targeted intervention, but also change across the full system.